The Fujikura Group's concept of social contribution activities is based on the Fujikura Group Corporate Philosophy MVCV (Mission, Vision, Core Values), which is to help customers create value and contribute to society through its "Tsunagu" technologies, as well as based on a statement in our CSR Basic Principles, which says, "each and every employees will become aware of his or her own role as a member of society, and act according to good social sense." We are carrying out social contribution activities in accordance with our CSR Basic Principles, setting forth the concept that "we make social contribution actively, respecting the cultures and customs of the various countries and regions we operate in." Our social contribution activities began in 1919 when Harukichi Nakauchi, a former auditor of the Company, established an institution for the mentally disabled, Fujikura Gakuen, with his own funds. Since then, we, both as a company and as individuals, have supported the institution. In the same regard, as times change, we as a company have considered how we should become involved with society and have taken actions accordingly up until the present day. We have contributed to society for over 90 years since Fujikura Gakuen's founding. Recognizing that our support for Fujikura Gakuen is the starting point of our Group's social contribution activities, we are committed to continuing our support of the institution. The Fujikura CSR Committee established the "Fujikura Group Basic Social Responsibility Principles" to enable easier, active promotion of social contributions by employees in conjunction with local communities. In line with its corporate philosophy and in response to the needs and expectations of society, the Fujikura Group will proactively conduct social contribution activities for the creation of a better society where people can lead more fulfilling lives. It was in 1919 that our predecessors made the sound of a factory construction hammer on the ground of Kiba in Tokyo. Since then, we have carved a history of about 100 years with everyone in the Kiba area. From the foundation in 1885 to today, we have nurtured and protected the corporate culture that "we value our customers and live with society," and to the heart of each and every employee to this day. The activities of social contribution that people have done as individuals and corporations are still unchanged, and we are breathing as a corporate culture. 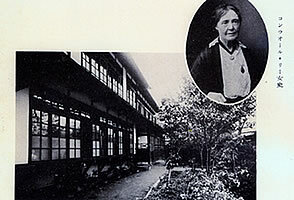 1916 Kenzo Okada (former managing director) began providing financial support to education as an individual benefactor. 1919 Harukichi Nakauchi (younger brother of the founder and former auditor) established Fujikura Gakuen in Oshima. 1929 Tomekichi Matsumoto (the first president) donated a building for the new clinic opened by St. Barbana Mission at Kusatsu for people suffering Hansen's disease. 1935 Tomekichi Matsumoto (the first president) donated all 530 volumes of Gunsho Ruijyu written by Hokiichi Hanawa for the launch of Ninomiya Bunko (present Tochigi Prefectural Library). 1936 Tomekichi Matsumoto (the first president) made a monetary donation to RIKEN to support its research activities. 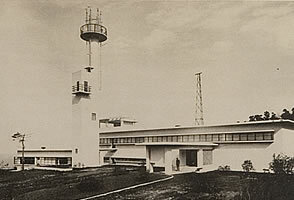 1938 Tomekichi Matsumoto (the first president) donated a meteorological station to Izu Oshima. 1939 Tomekichi Matsumoto and Fujikura Group companies established the research foundation named "Fujikura Kenkyusho" (present Fujikura Foundation) to conduct and support R&D. 1965 Restarted the education support activity launched before the Second World War via Fujikura Ikueikai. Fujikura Gakuen was founded on June 7, 1919 by Harukichi Nakauchi, younger brother of the founder of Fujikura and former auditor of the Company. He donated 230,000 yen (equivalent to about two billion yen today) from his own funds to construct this school for the mentally disabled on land extending over about 132,000 m2 in Izu Oshima. He also donated this land and the facilities necessary for the foundation of the school. Currently, there are facilities in Izu Oshima and Tama (Hachioji city), about 100 staff members are doing education and welfare on a 24-hour system for about 130 students. Since its founding, the presidents and executive officers have supported the management as directors, and donations from employees have been continued to date as well as company donations. We hope to continue to support "Fujikura Gakuen" as the origin of social contribution activities in the future. 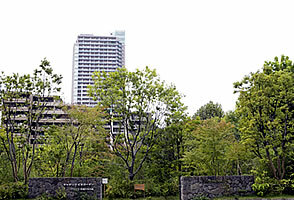 Founding Bio Garden "Fujikura Kiba Millennium Woods"
In the redevelopment of the headquarters site, the Fujikura Group received a request from the local schools and local residents for planting and attention to biodiversity, and in November 2010, the Fujikura Group announced the pre-space bio Garden "Fujikura Kiba Millennium Woods" founded in the headquarters premises. "Fujikura Kiba Millennium Woods" contains the wish that together with local residents in Koto area Koto ward "rich nature will continue until the future of one thousand years ahead." There are 2,200 m² in size, two ponds and streams connecting it, a floating island, a promenade, etc. In order to reproduce the rich forests and forests of Musashino earth hundreds of years ago as living creatures have priority, We stuck to the native species specially. For details of "Fujikura Kiba Millennium Woods"
In the Fujikura Group, we will continue to support the people of Fukushima suffering from the fight against the rebuilding of the Great East Japan Earthquake and the damage caused by the rumors of nuclear accidents, and even during the course of time the experiences of the Great East Japan Great Earthquake deeply carved into our hearts We will continue "campaign" to go to Fukushima! "From the mind that it prepares for a huge earthquake that comes with the determination of "not forgetting "absolutely not weathering." Following last year, the Fujikura Group volunteered for reconstruction assistance in Minami Soma City, Fukushima Prefecture, from 15th to 16th December 2017. Thirteen employees participated and improved the bamboo bus. In the Fujikura group, we visit events such as stores dealing with products in Fukushima prefecture in Tokyo and Tohoku reconstruction goods exhibitions, purchasing local specialties from Fukushima, eating and supporting them. The Fujikura Group supports the activities of the Fujikura Foundation, which gives financial assistance to researchers in the field of science and technology. This public interest incorporated association was initially launched as a research foundation (Fujikura Kenkyusho) by the second president Arata Matsumoto, being funded by the first president Tomekichi Matsumoto (100,000 yen) and by Fujikura Insulated Wire &Cable Ltd. (present Fujikura Ltd.) and Fujikura Kogyo (present Fujikura Rubber Ltd. and Fujikura Kasei Co., Ltd.) (1.1 million yen in total). 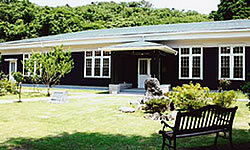 The research foundation was opened in Yono City, Saitama Prefecture and then relocated to Sendagaya and then to Samezu. At the facility, research was conducted focusing on polymers. Subsequently the name of the foundation was changed to "Shinsei Shigen Kyokai" in 1946 and the main activity of the foundation was changed to give financial assistance to researchers and engineers. Since then Fujikura has been contributing to society by supporting the activities of this foundation. The foundation became a public interest incorporated association on April 1, 2011 and changed its name from Shinsei Shigen Kyokai to the Fujikura Foundation on November 1, 2012. The Fujikura group holds volunteer "Pro Bono" activities using the expert knowledge and techniques employees gain in their work. Below is a list of those efforts. Collaboration with NPO / NGO etc. Our company group supports participation in local communities and the development of local communities and participates in various activities. As one of these activities, we are also collaborating with NPO/NGOs and others. The main NPOs / NGOs are as follows. Fujikura has started selling TFT healthy lunch at the head office cafeteria since January 2014. TFT is a social contribution activity tackled by NPO Table for International, which tries to simultaneously resolve social problems of developing countries suffering from starvation and malnutrition and developed countries suffering from obesity and lifestyle diseases at the same time. When employees purchase TFT healthy lunch, 20 yen per serving will be donated from our company and will be used for school lunch fees for children in developing countries. 20 yen is equivalent to the amount of one serving school meal in developing countries. Fujikura sponsored the "Koto Cinema Festival" held in Koto wards Kobuishiwa Cultural Center near the headquarters in 2017 as well. This cinema festival is intended to nurture new culture, and is planned and executed with the combined efforts of citizen groups and local government on the theme "Let's make Fukagawa a movie town." The town lives up to the example of locally born movie director, Yasujiro Ozu. Fujikura participated in the local Furuishiba Children's Festival, held on July 9 of 2017, and hosted an event to go see the kingfishers in the "Fujikura Kiba Millennium Woods" bio-garden. 20 elementary students and their parents saw the Millennium Woods' kingfishers. Our company invited about 30 kindergarten children and their guardians to the Biotope "Fujikura-Kiba Millennium Woods" for a potato digging event. The children were able to learn about the wonder of “living things” as well as the role of the “Millennium Woods” Biotope. As in the previous fiscal year, we cooperated in the blood donation activity conducted by the Japan Red Cross Society with the participation of 86 employees in the Fukagawa district, where the head office is located. Fujikura holds the "Fire Plaza in Fukagawa" by the Shenzhen Fire Department during the "Spring Fire Prevention Campaign" in March every year in "Fukagawa Gazzaria," and from FY 2017 three times a month (8th, 18th Day, 28th) We are carrying out disaster prevention drills "Disaster prevention deli" that customers will participate. Such a cooperative activity was appreciated, and as a part of the Tokyo Fire Department's 70th anniversary event, we received a letter of appreciation from the Fire Department general. Fujikura is a "Fukagawa Gatharia" that was born as a result of the redevelopment of the former Fukagawa Factory, and held various events and events in Fukagawa Gatharia for many office workers and local communities who work in the vicinity, actively I participated in local community activities. May: GW event "Spring Gazza Fes (Music and Outdoor Event)"
Implemented BBQ and Potato Experiencing Event at "Fujikura Sakura Millennium Woods"
At the Fujikura Sakura Works we invited employees and their families on November 3, 2017, and held a BBQ and Totoro experience event at "Fujikura Sakura Millennium Forest." "Fujikura Sakura Millennium Forest" is a green space in the workplace for the purpose of protecting the natural environment, building employee health, community with neighboring residents, etc. The children were very pleased by touching nature at the workplace where their father and mother are working. At the Fujikura Suzuka works, we pick up garbage around the establishment and weed out weeds once a month at lunchtime, and many employees are actively participating. The Fujikura Suzuka Works participates in corporate briefing sessions of neighboring high schools every year. We also accepted internship from local high school. The Fujikura Numazu Works also cleaned the Numazu city Senbon Beach coast of Fujikura, Meidensha, Ricoh this year and collected plastic products scattered on the coast, wood scraps, bottles and cans. This activity drains the water discharged from each company to the adjacent Shinkanchawa, and from the fact that it flows to the final Senbonohama coast, we conduct clean-up activities jointly by three companies during the environmental month. The Ishioka works provides a place for intellectually challenged students to sell breads made by them at a bread making facility operated by “Heartful Village” which is a local disabled support facility. The bread is sold twice a week during lunch time at the employee cafeteria. DDK conducts visit sales of sweets shop "Piquet" operated by the Challenge Center (Kobushi Association), a disabled support facility located in Tochigi Prefecture, twice a week at lunch break. Since this disabled support facility "Challenge Center (Kobushi no Kai)" has been cooperating with people with disabilities in DDK for some time now, we also started selling bread. A lot of employees gathered at lunch break and it is very popular. We will continue this activity that supports the working environment of people with disabilities and employees can eat delicious bread. Nishi Nippon Electric Wire & Cable implemented a summer vacation trip to the plant titled "Bring Your Child to Work Day," once again. The event was for children of employees. 18 elementary-school-aged children from 14 families participated on the day. Nishi Nippon Electric Wire & Cable registered for the "Keep it Clean Oita Promotion Project" promoted by Oita city, and participate in cleaning around our plant. The plant formed The Nishiden Volunteer Group for the cleaning, and they work to clean during lunch breaks. Every year, the employees of Fujikura Automotive Asia use the money from sales of empty cans and plastic bottles to recycling companies to give presents to the residents of the "Sakuranbo House" facility for the learning disabled. This year, 6 employees visited to deliver the presents once again. Held the "Fujikura Automotive Cup Little League Baseball Tournament"
Fujikura Automotive Asia Ltd. holds the "Fujikura Automotive Cup Little League Baseball Tournament" every year at the baseball field on the Hachimanbara plant grounds with the goal of supporting sports for local boys. Once again, 20 employees participated as umpires and administrative support this year. Fujikura electrical equipment participated in the Uesugi snow lantern festival held by Yonezawa City. We also participated in the event to make customers snow lanterns and greet customers with warm lights and raised the local festival. Tohoku Fujikura is the Minister of Health, Labor and Welfare at the 53rd National Conference on Blood Donation Promotion Movement, which was held at Akita Prefectural Budokuban in Akita City under the presence of the Crown Prince and Crown Princess, Honorary Vice President of the Japanese Red Cross Society, I was awarded the award. We have continued blood donation activities twice each year for a long time, and it was recognized that many employees cooperated so far. We will continue to proactively donate blood as part of our community contribution. Fujikura Precision was accredited as one of the brightest companies in the Kumamoto ken Bright enterprise promotion project. "Bright enterprise" is a coined word by Kumamoto Prefecture, has a high degree of satisfaction of employees and their families, is valued in local employment, has a high degree of contribution to local society and regional economies, is performing stable management Etc. are the basic requirements as "bright company." Fujikura Precision donated an optical fiber fusion splicer to the prefectural Kamoto commerce and high school in Yamaga City, Kumamoto Prefecture. This is a new graduate recruitment interview exam conducted last October, because the student of the school talked that "There is practical training to connect optical fibers at our school." If there is such practical training, we decided to give a donation promptly because of fusion splicer made by Fujikura. Kyoei High OPT regularly holds beautification activities of the footpaths around the plant. The usual main focus is picking up garbage, but they also take safety into consideration, destroying and flattening mole tunnels made in grass areas near sidewalks. Fujikura Cube sells wood chips that effectively utilize the demolition waste of drums for gardening. We purchase waste materials from group companies, manufacture and bag them on chip machines, named them "Magical Wood Chips" and sell them at three places at around half the market price. This "Monogami wood chip" is also popular among local people. Field trips are held for job seekers and their families from special needs education senior high schools and from the local job-seeking and lifestyle support center, and for staff of the job-seeking support center. Workplace training for job-seekers is also accepted. AFL in the United States participates in activities as a member of Habitat For Humanity, an international support group. Employees built the house together. This group solves the problems of poverty and poor housing mainly in developing countries and is working on housing construction and independence support activities. AFL in the United States has a 4-year scholarship to excellent students entering the university. This was named "Naruse Academic Scholarship" with the thought of Mr. Toshihide Naruse (Former Managing Director of Fujikura) who worked hard at establishing AFL. America 's AFL Company donated $ 2,000 to Pemi Youth Center to support young people' s education. The FAI company in the United States participated in a project that NPO called Habitat for Humanity is doing and made a play house where children play. I painted the play house, assembled it, and donated what I made. The FAI company in the United States recruited canned donations, warm clothing and toys from employees, gave each gathering to the three NPOs, and gave them to the disadvantaged people during Thanksgiving and Christmas. Participation in "San Antonio Threads"
American FAA participated in "San Antonio Threads" to donate clothes and personal care products to disadvantaged teenagers. American FAA participated in the painting activity of the house of the poor area sponsored by Martin Luther King Jr. commission. Participation in "Cnadles for Life"
In the US FAA company, employees and their families participated in "Cnadles for Life" to support cancer patients and donated. Fujikura Automotive Mexico, S. de R.L. de C.V.
FAXX in Mexico donated money gained through waste recycling to the "Herat to little herat program" to recruit children for cardiac surgery and was awarded by the state government. FAAXS in Mexico was recognized and awarded as a company with social and labor responsibility. In October 2017, FAP awarded the National Award for Quality and Excellence in Management (international company National Quality Award) from Cheong Wa Dae of the Republic of Paraguay. This is due to the goodness of FAP's products / services leading Paraguay's automotive industry, and the government's recognition of FAP's contribution to society through education and social programs. FAE in Spain made a plan for a paddle tournament to promote employee health promotion and internal revitalization. FAE of Ukraine also supports employee's football team. The FAE company in Morocco has offered donated goods that the association wishes to the association of the area that manufactures organic products on women's day to support women. At FAE in Ukraine, we participated and celebrated on the occasion of Ukrainian folk costumes to succeed traditional culture. FETL company in Thailand planted mangrove trees to promote activities for environmental preservation. Many factories of FETL companies such as Nawanacon and Ayutaya are participating in this activity in cooperation with the government's environmental department. FETL company in Thailand carries out blood donation every year at each factory. Many employees also participated this year. FETL company in Thailand participated in events of children's day for employees and organized events for children to enjoy. Also, I donated sports equipment and stationery etc. FETL company in Thailand received a "Zero Accident Campain 2017 Award" as a safe factory from Ministry of Labor (MOL), and was awarded. FCH Corporation in China cooperated with FESL (Fujikura Electronics Shanghai Ltd.) located in the same China and visited an orphanage in Shanghai Children's Medical Center (Shanghai Baishanoya). We volunteered and donated at an orphanage. Fujikura Hengtong Aerial Cable System Ltd.
KFH in China carries out blood donation activities every year. Many employees also participated this year. KFH gathered donations from employees in August 2017 and donated to Qinghai Hainan Province Autonomous Region Kyowa Province as support for poor areas. Korea's FKA Company carries out an in-house sports festival every year to promote employee health support and internal revitalization.